Your New Jersey Automotive Headquarters! After 20 years in business on April 1'st 2009 Jeff sold the business to his long time and devoted employee Kevin Smalley along with his wife Frannie. Kevin has been a fixture in the company since 1996 and even continued to work part time after leaving for Surf Chevrolet in 1999. He would come and run the shop for Jeff while taking his vacation so Jeff and his family could go on vacation. Kevin returned full time in 2004 and has the knowledge and drive to continue the high quality of service that our customers are used to. Most of our customers already have a long relationship dealing with Kevin and Jeff was even teased at times "when are you going to let Kevin take over". Welcome Kevin and Frannie! The "Jeff's" in our name is unofficial. The registered name is Budget Brakes and Mufflers. In 1988 Jeff Shields and his wife (Helen) purchased a franchise for Bargain Brakes & Mufflers in Point Pleasant. A location on Bridge Avenue was found, and the business opened in 1989. The business grew rapidly. People liked our honesty and good service. In 1992, however, Bargain Brakes & Mufflers went bankrupt and we became independent. We were advised to change our name. Jeff chose "Budget" in order to keep the name close to "Bargain". To this day most of our original customers still refer to and write their checks to Bargain Brakes & Mufflers. The Bridge Avenue location was limited in parking, and by 1993 we were experiencing phenomenal growth. We started looking for another place, and soon the State Highway 88 location was found. After completing the move in June 1994, we began adding more services besides the under-car specialties. Customers preferred not to have one mechanic for under-car service and another for everything else. They were overjoyed when we said, "we can fix it." Today we offer services that include everything from oil, lube, and filter change to engine replacement. 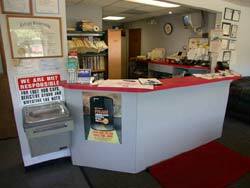 Over the years we have become the Point Pleasant and surrounding areas' complete auto care company. We still have many customers who came to us when we were Bargain Brakes & Mufflers. We always go the extra mile to make sure you drive away satisfied. Call us today to see what we can do for you.